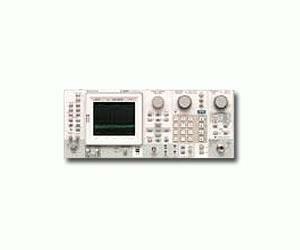 The Tektronix 2753P Programmable Spectrum Analyzer offers a broad selection of features and benefits to meet wide-ranging needs for laboratory-level frequency domain spectrum analysis. The 2753P features the same functionality and high level of performance as the 2756P, but over a frequency range of 100 Hz to 1.8 GHz It is optimized for standalone or automated operation in baseband through UHF measurements, where the ability to identify and process weak signals is critical. The unit provides full IEEE-488 (GPIB) programmability.